Office Space at Full Capacity in Only a Few Months! 6 Months after starting their campaign, SuiteWorks has filled every single office space, and their business has transformed! Not only have we built beautiful pages filled with quality content, we’ve significantly grown SuiteWorks' audience, increased engagement, and provided massive local reach. Since we started working with SuiteWorks, we have increased their amount of Facebook clicks from 0 to 1,200 and social engagement substantially. This has created a conversion rate of over 75% with an average lifetime value of $5000. We produce, edit, and share dozens of unique videos every month for SuiteWorks. 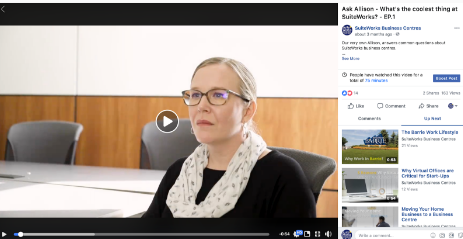 Here is an example of a series called “Ask Allison” where we interview their client care manager weekly (Clients love it and it adds personality to the brand). SuiteWorks continues to generate sales, increase their online presence, and consistently engage with the community about upcoming events and additional offerings they provide.